My complaint has been referred to the Legal Department. How long does it take for this department to process my complaint? The Registrar processes complaints as quickly as possible. If you have not received anything by mail from the Registrar within the next 3 weeks, please feel free to contact us. The investigator referred my complaint to the Legal Department. What happens in the Legal Department’s review process? A formal Citation will be issued providing the contractor with an opportunity to answer the charge(s) contained in the Citation and complaint. What happens after a Citation has been issued to the contractor? The Citation provides the contractor with 15 calendar days to file a written answer with the Registrar. I, as the complainant, received a copy of the Citation; do I need to do anything? Yes, if you prefer the investigator to attend hearing, you must send the Request for Investigators Testimony back to the ROC. I, as the contractor, received a copy of the Citation; do I need to do anything? Yes, you should follow the directions contained within the Citation. Does the complainant get a copy of the Citation? All notices issued by the Legal Department are mailed to both parties. Does the complainant get a copy of the contractor's answer to the Citation? Yes, if an answer is timely filed, the Legal Department will mail a copy to the complainant. How can I file my answer? If faxing a written answer, you may call 10 min after sending to confirm your answer was received. Please note, an answer is not filed with the Registrar until the Registrar receives the answer. What happens if the contractor does not file a timely written answer to the Citation? A Final Order will be issued by the Registrar imposing discipline upon the license. What happens if a timely answer is filed to the Citation? The Registrar will issue a notice of hearing to all parties after obtaining a hearing date from the Office of Administrative Hearings. That notice of hearing will be mailed at least 30 days before the hearing date. Do I need to attend the settlement conference? If a conference is scheduled, it is in the best interest of both parties to attend the conference in order to work towards a resolution. However, the complainant is not required to attend. A hearing has been scheduled. What now? •	A list of all the exhibits that the party will use at the hearing. The disclosure can be submitted using the Prehearing Disclosure Statement form. Is complainant required to attend the hearing? Yes, the burden is on the complainant to prove that the contractor violated the charges contained in the Citation and complaint. I live out of state now. What are my options for attending the scheduled hearing? You may contact the Office of Administrative Hearings for all available options at 602-542-9826. When will the order be issued after a hearing? After a hearing, an Administrative Law Judge has 20 days to send to the Registrar a recommended decision. The Registrar then has 30 days to issue its final order adopting, modifying, or rejecting that Administrative Law Judge’s Decision. How can I add new allegations to my complaint? If a Citation has already been issued, the complainant must file a new complaint. If the complaint is pending with the investigator, the complainant may submit a request to amend the complaint. That request will be reviewed by the assigned investigator. How can I pay my civil penalty to the Registrar? What happens if my case gets resolved before a hearing? Send your written notice of resolution, signed by the Complainant, to the Register. My final order says my license will be suspended for 1+ days. When will the suspension take place? The suspension will be imposed the day after that order becomes effective. For example: The order provides that it will be effective on July 1, 2016. The suspension will be imposed on July 2, 2016 unless that day is a Saturday, Sunday, or a holiday. The license was suspended until the contractor complied with the terms of the order. My case is now resolved. Where should I send the notice of resolution? Can I obtain copies of complaint files? Or license files? Yes, by submitting a Public Records Request form. Requests are processed in the order in which they are received. It takes approximately 7-30 days to process depending on the volume of your request. How long does a closed complaint show on the Registrar’s website? Complaints appear for a period of 2 years from the date the case closed. How do I reinstate my revoked license? A revoked license cannot be reinstated. The contractor must resolve all outstanding complaints, pay outstanding civil penalties (if any), and reimburse the Residential Contractors’ Recovery Fund (if any payouts). After all loss caused by the revocation has been cured, persons named on the revoked license may apply for a new license in accordance with A.R.S. § 32-1122 and A.R.S. § 32-1161. The contractor has not complied with the written directive, 15 days have elapsed, should I get 3 estimates to apply to Recovery Fund? That is optional at this time. Please visit Recovery Fund's FAQs. I received a judgment from Justice Court/Superior Court, can I apply for Recovery Fund? You may be able to submit an application with the Recovery Fund. Please call and request to speak to the Registrar’s Recovery Fund Department for additional information. Please call the Registrar’s office and provide your case number for detailed information related to your case. I filed against the contractor in Justice Court/Superior Court; must I close my case with the ROC? The simultaneous filing of a complaint with the Registrar and another court does not prevent the Registrar from taking action related to your complaint. Can the ROC help me learn more about a lien that a contractor filed on my property? No, the ROC does not regulate liens. State law on liens can be found in Title 33. Parties are allowed to be represented by an attorney, but an attorney is not required. A party is allowed to handle its own case. A business entity may be represented by an officer or employee, subject to A.R.S. § 32-1156(B). Will the Attorney General represent either the complainant or the contractor? No, the Attorney General will only represent the state agency. Can the ROC refer me to an attorney? No, the ROC cannot give attorney referrals. A person may look for an attorney on the State Bar of Arizona's website. Why does the contractor get so many chances? In short, the complaint process provides the contractor due process rights. The ROC is required to follow the complaint process established in state law. How long does a suspension stay in force? For as long as the order instructs, whether it is 1 day, 7 days, 14 days, etc. An order may also say that a contractor's license is suspended until the contractor complies with the terms of that order. If the complainant successfully presents a claim to the Recovery Fund, then the license will again be or remain suspended until the Recovery Fund is repaid. Can a contractor get a new license after a license suspension or revocation? The contractor must comply with the order issued, and if a complaint resulted in a payout from the Recovery Fund, then the contractor must repay the Recovery Fund. Please refer to the provisions of A.R.S. § 32-1161 with respect to the timing and requirements applicable to the issuance of any new contractor's license to the previous license holder or to any of its personnel. If a person is listed on a suspended or revoked license does it impact other licenses on which that person is named? Yes, A.R.S. § 32-1154(A)(20) provides for suspension or revocation of the other licenses after due process. As a licensee's qualifying party, member, or officer, once I disassociate from the license, am I still liable for complaints? Yes, pursuant to A.R.S. § 32-1154(A) you are responsible for any act or omission that occurred while you were listed on that license. Where can I learn more about the Arizona Office of Administrative Hearings? 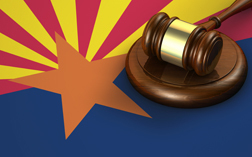 Visit the Arizona Office of Administrative Hearings' website.